Ingredients: organic black tea, bergamot essential oil. As some of you are probably well aware, I am very fond of Earl Grey tea. Bergamot is perhaps my favorite tea flavoring … or at the very least, it is in my top three, together with jasmine and chocolate. This is a very fine Earl Grey from TeaSpree. Having tried several teas from TeaSpree, that comes as no surprise to me, I have been quite impressed with their offerings! The black tea is smooth and pleasant. Brisk, but not overly aggressive, this would make a charming afternoon pick-me-up. There is very little astringency to the tea – just a bit at the tail of the sip – but not so much that it leaves the tongue feeling overly dry. No bitterness, in fact, at the point in the sip where I occasionally experience a slight bitter note when sipping black tea, this tea comes off tasting slightly sweet. It’s a little different, but quite enjoyable, and it nicely accents the bergamot. The bergamot is not overdone in this tea. It has a very agreeable level of strength without becoming overwhelming or tasting like it’s overcompensating. It doesn’t have that fake, chemical aftertaste to it – it just tastes like a sweet, tangy burst of citrus. Delicious! While I prefer my Earl Grey without the addition of milk or cream, I know that some of you probably do like it. I think that this Earl Grey would take very nicely to such an addition. It is also quite nice straight up! 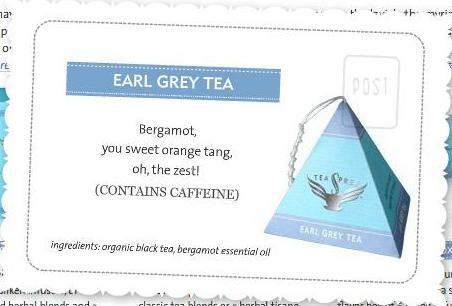 A high recommendation to all Earl Grey enthusiasts out there!